My family has been frequenting Baskin Robbins ice cream parlors for over 30 years, and we always come to the same conclusion - the ice cream is first rate, while the service is not great. In fact, it's almost downright terrible at times. 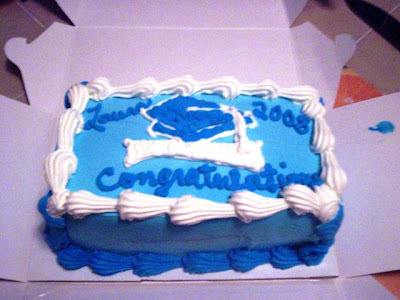 However, I am in love with their ice cream cakes - especially because of their awesome frosting - and since I am graduating from college tomorrow, Mom decided to get me one from the local Somerset, MA, branch to celebrate the occasion. Since you can order any cake via their Web site, Mom went online to set up what she wanted. I chose to have rocky road ice cream on top of white cake, and Mom chose a graduation design for the 1/3 sheet cake (feeds 6-8 people). The cake would read "Congratulations" in the center and "Laura" and "2008" in each top corner. After printing out the page, on Saturday Mom and I went to the Somerset Baskin Robbins, which is on County Street. It is in the same building as a Dunkin Donuts. When we walked inside, it took us a few minutes to get noticed, meaning that the employees were all standing around chatting and not paying attention. When we were finally spotted, a girl came over to ask us what we wanted. Mom told her she wanted to order a cake, so the girl retreated to the back room and came out with what looked like an order sheet. As Mom whipped out her printed page from the Internet and began giving instructions, the girl checked her cell phone to see if she had missed a call between getting the order booklet and walking back to the counter. A little rude, don't you think? Anyway, after this girl and Mom synchronized my cake instructions, we were on our way. She did give us a receipt, but it did not have a price on it (and we forgot to ask what it was going to cost). The cake was to be ready by 5 p.m. on Friday. We drove away hoping that the girl did not take a cell phone call right after we left because she might forget to put the order in. Oh well. We had our fingers crossed. 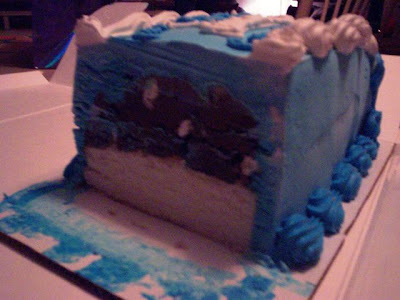 Fast forward to Thursday night, when Mom decided to call the Somerset Baskin Robbins to see how much the cake was going to cost. The first thing she did was try to find out the phone number. Not only are they not listed in the phone book, but they are also not listed with directory assistance. Who doesn't put their business in the phone book/411? 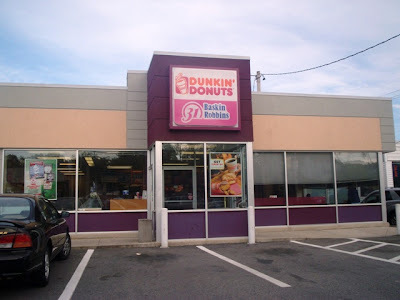 Seeing that they were attached to a Dunkin Donuts, Mom decided to call there to see if they could connect her with the Baskin Robbins staff - in the same building - two feet away. The Dunkin Donuts girl gave Mom the phone number so that she could call over there herself. She called the number repeatedly, but no one picked up. Mom decided to call Dunkin Donuts back and ended up getting the same girl. She asked the girl if there was anyone over at the Baskin Robbins counter, and she replied, "Yes, ma'am. I can see them from here." Mom, still not knowing why they weren't answering their phone, tried calling again to no avail. Exasperated, Mom gave up on the Somerset location and decided to try the Dartmouth Baskin Robbins (yes, they're listed in the book) to see if the phone number she had for the Somerset location was indeed correct. They quickly informed her that they were not associated with the Somerset Baskin Robbins because each store is independently owned. Frustrated, Mom decided that it was virtually impossible to reach the Baskin Robbins where she ordered my cake. Good thing we didn't have to make any last minute changes. Finally, Friday arrived. At about 5:35 p.m., I walked into the Somerset Baskin Robbins to pick up my cake (yes, I had to pick up my own cake). I was greeted right away (rare) and told the girl behind the counter that I was there for a cake. She disappeared into the freezer area for 15 MINUTES! Honestly, I thought that she had died back there, but I was more worried about my cake. What was going on? All I knew was that I was waiting for something that we had ordered a week ago. Why wasn't it ready? Did they lose it? I was about to. Finally, at almost 6 p.m., the girl reappeared. I said, "I thought you got lost back there," and she just smiled and handed me my cake. Mom had a $3 off coupon, so the total came to $12.99 ($15.99 without the discount). I handed her my money and then raced home so that my beautiful cake wouldn't melt on the ride back to Fall River. After dinner, we cut into the cake (well Mom did; I have weak hands). I was dying to reacquaint myself with that lovely frosting. IT DIDN'T HAPPEN! Apparently, Baskin Robbins changed the frosting on me. It may just be because this was a specialty cake, but I was looking forward to that ice creamy type frosting that I've been eating for almost 30 years. I was almost heartbroken, except for the fact that the rest of the cake tasted great. The rocky road ice cream was filled with nuts and marshmallows, while the white cake was somehow still soft and tasty. The frosting was pretty good, it just wasn't my frosting. I really do love my cake, and everything else I've ever gotten at Baskin Robbins. When I was younger, I used to get the clown sundae all the time, and I really enjoyed eating all of their 31 flavors. They also have fantastic milkshakes and smoothies, along with tasty sundaes and ice cream novelties (found in their freezer section). We also love the fact that this is one of the only ice cream parlors that uses real cake instead of "cake crunchies." Baskin Robbins is a little more expensive than a roadside ice cream stand, but the taste is quite good. Our only complaint is about the service, which is usually the same at every location we've ever visited. The staff is usually made up of a bunch of teens, and there never seems to be a manager present. As a result, there is a lot of goofing off, and they think nothing of finishing their conversations with each other when there is a line of customers waiting. This makes for very slow service. For something as simple as an ice cream drink, be prepared to wait about 20 minutes. Again, this is at every location. It's very frustrating to be standing at the counter and watching four or five kids laughing and acting silly while you're waiting for your order. The worst part of it is that they look at you, and then look away! What's up with that? Hands down, the service is the worst part of the Baskin Robbins experience. If we were just rating on taste and quality alone, we would give it four hearts (very good). However, since the service is barely even two hearts (so-so), we've averaged it out at three. Don't make us go any lower, Baskin. 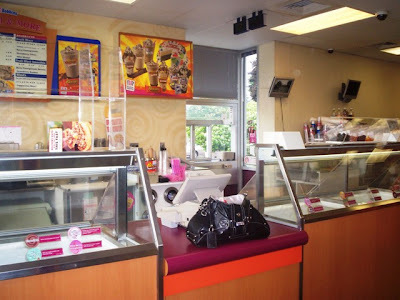 The Baskin Robbins in Somerset is located at 978 County St. For more information, call (508) 673-4809. Let's hope someone answers the phone!